This is one of my “go to” meals. 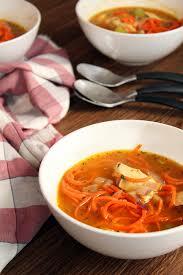 In fact, I share this recipe on a regular basis at our store. We celebrated our son’s Birthday last weekend. The weather was a little iffy so we opted for cooking inside. You can’t help but feel the love when you share this meal with family. You can make baked potatoes and salad or pair with your favorite Herold’s Salad for a wonderful summer meal. Enjoy! Put butter on a cookie sheet (with at least 1 inch edge), place in preheated oven and melt the butter. The weather has been so gorgeous. We have been grilling out about every night. Those of you that know me know that I am a Weber girl. I love my Weber charcoal grill. My current model is at least 10 years old and it still works great. I am partial to charcoal grilling but I understand the arguments for gas grills. I am not trying to convert you I am just going to encourage you to grill out and enjoy these beautiful Summer afternoons and evenings. 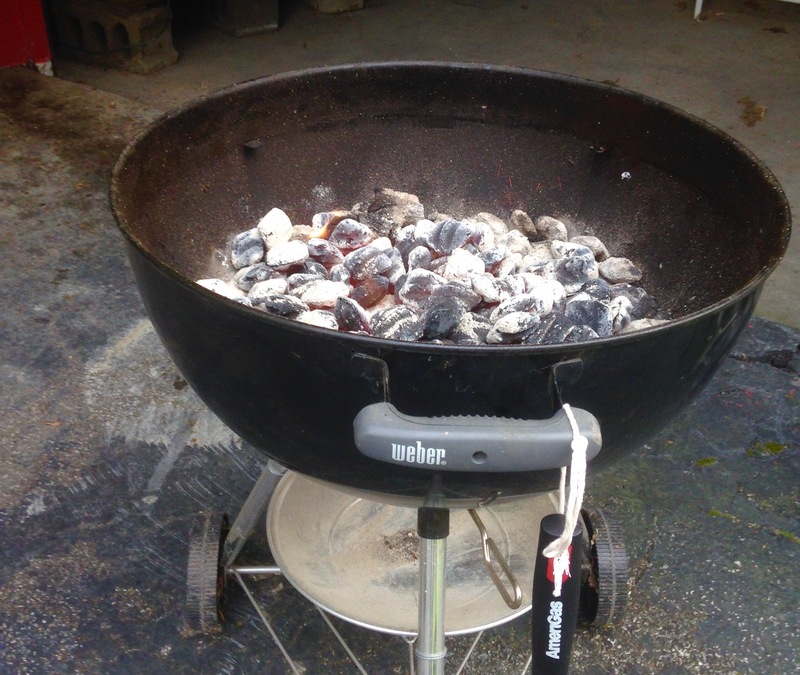 If you do use a charcoal grill, make sure you allow 30 minutes for your coals to get ready. You can either use a chimney to heat the charcoal or you can stack the charcoal in a pyramid in the grill and use lighter fluid to light the charcoal. You can also mix in some lump charcoal with the charcoal to give you a nice flavor and increased cooking time. My favorite grilled meat is chicken breasts. I am going to use that as my recipe today. Liberally rub the chicken breasts with the BBQ Rub. Place the Meat side down on the grill and cook for approximately 7 minutes. 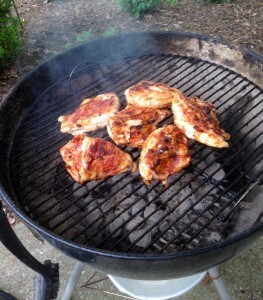 Make sure the other side of the breasts are sprinkled with the barbecue rub before you flip the breasts. Cook for approximately 7 minutes. Flip the breasts back to the original side. The breasts will get blackened. Make sure there are no open flames under the breasts. Keep a spray bottle of water to douse the flames. Cook for at least 45 minutes until the thickest part of the breast meat is done. Take a serving dish and pour a bottle of barbecue sauce in the dish. Cover the cooked chicken breasts with the sauce. This is absolutely delicious. Leftovers can be refrigerated in the serving dish. If the dish is oven-proof the leftovers can be heated at 200 degrees for about 20 minutes and served for another meal. Enjoy–nothing says summer like grilling out! Until next time…From our Butcher Block to your Table. This is such a gloomy day in May. I am feeling the need for some comfort food. 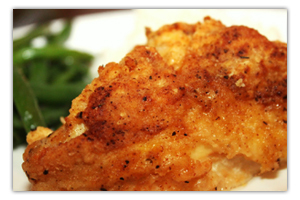 I don’t have to go too far to feel the “love” when I make oven fried chicken. Put potatoes in the oven, make a salad and you have a meal fit for a king–or at least a Butcher and his wife.